The Minneapolis Park and Recreation Board will hold series of Citizen Advisory Committee meetings regarding improvements to Theodore Wirth beach & picnic areas. The first meeting will be March 25, 6:30-8:30 p.m. MPRB boardroom, 2117 W. River Rd. FFI: 612-230-6464 or jringold@minneapolisparks.org. This entry was posted in Wirth Park on March 22, 2010 by Chris. The Minneapolis Park and Recreation Board (MPRB) of Commissioners has moved ahead on its search for a new superintendent. The Board appointed an interim superintendent and selected a search firm at its March 17 regular meeting. The Board approved an agreement with David L. Fisher to serve as the interim superintendent from July 1, 2010, to Oct. 31, 2010. Fisher’s contract takes the MPRB through the National Recreation and Park Association’s (NRPA) Congress and Exposition being held in Minneapolis Oct. 25-29. The MPRB has a host role in the event, which is the largest exposition in the park and recreation industry, and is expected to draw between 4,000-6,000 attendees from around the country. Fisher is no stranger to the Minneapolis park system. He spent more than 30 years with the MPRB, including serving as superintendent from 1981-99. He also worked as Assistant Superintendent for Operations (1977-81), Director of Park Operations (1974-77) and Park Operations Planner (1970-74). His notable accomplishments at MPRB included partnering with the Walker Art Center and University of Minnesota on the development of the Minneapolis Sculpture Garden; inaugurating the first urban National Scenic Byway, the Grand Rounds; leading concept and collaboration efforts for Neiman Sports Complex; and completing the development of the neighborhood park system concept that guaranteed that no resident would live more than six blocks from one of the city’s parks. As superintendent, Fisher hosted the last NRPA Congress held in Minneapolis in 1994. From 2001-2010, Fisher served as executive director of the Great Rivers Greenway District in St. Louis, Mo. By unanimous vote, the MPRB Commissioners selected Waters-Oldani Executive Recruitment, Dallas, TX, to conduct the search for a superintendent. The other finalists were Alliance Resource Consulting LLC, Long Beach, CA, and Ralph Andersen & Associates, Rocklin, CA. Waters-Oldani has over 30 years of experience nationwide in executive recruitment for private, non-profit and public organizations, in addition to other units of government. Waters-Oldani’s tasks in the search process encompass developing the candidate profile through interviews with the Board and public input sessions. Waters-Oldani will also screen candidates, conduct initial interviews and test semi-finalists. More information on the search process can be found at minneapolisparks.org – 2010 Superintendent Search. This entry was posted in Board Meetings on March 19, 2010 by Chris. 5:00 P.M. REGULAR BOARD MEETING. The Board will be voting on accepting the low bid of Waste Management for 2010 solid waste and recycling services for $180,000. There were three other bids. The City of Minneapolis was the next lowest bid. Currently, Waste Management has the contract and Park Watch was able (through the Data Practices Act) to see it; but the appendices containing the contractual amount were missing and have not yet been provided. The Board will also be voting on supporting “Legislation for a personal property tax exemption for concessions on park owned property similar to City of Minneapolis exemptions.” This is a staff driven proposal that the public should have an opportunity to review before coming before the Board for a vote. Administrative staff have been advocating that Park Board concessionaires should be sheltered from paying personal property taxes. These for-profit concessionaires include a hotel, a private event center and a charter party boat. This legislation creates incentives for privatization of parkland and will decrease our tax base. This agenda item should be either voted down or postponed so that the public can understand and comment on the consequences of such legislation before it becomes law. The Board will be voting on a four-month agreement with former Park Board Superintendent David Fisher to be interim superintendent beginning July 1, 2010. 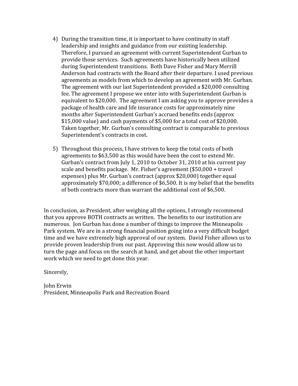 The Board will be voting on an agreement with departing Superintendent Jon Gurban who, by signing a consulting contract with the Park Board, will be able to maintain his health insurance benefits through June 30, 2011. He also will receive cash compensation of $5,000. 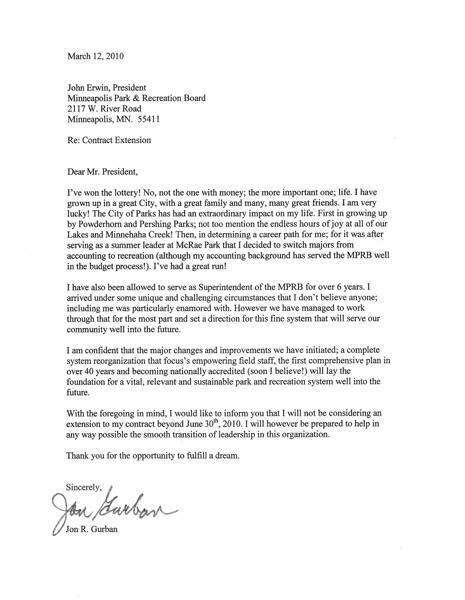 The MPRB Board received a letter on March 12 from Superintendent Gurban giving notice that his last day as superintendent will be June 30, 2010. 6:30 to 8:00 P.M. The Board will be conducting in-person interviews with representatives from three search firms with the intention of selecting one to conduct the search for a new superintendent. The regular meetings are rebroadcast on Channel 79 at 1 p.m. Saturdays and 5 p.m. on the second and fourth Wednesdays of each month. Webcasts for the recent two months are posted two to five business days after the meeting and are available for viewing under “Webcast Archives” at the web site. This entry was posted in Board Meetings on March 16, 2010 by Chris. David Fisher has agreed to serve as interim superintendent for four months after the contract of current Superintendent Jon Gurban expires June 30, Board President John Erwin said. The past would temporarily become the future under a proposal before the Minneapolis Park and Recreation Board next week to hire former Superintendent David Fisher to fill a leadership gap. Board President John Erwin said Fisher has agreed to serve as interim superintendent for four months after the contract of current Superintendent Jon Gurban expires June 30. That would take the district through October, when it hosts the National Recreation and Park Association annual meeting. The proposal was greeted favorably by the five commissioners contacted by the Star Tribune Friday. They make up a majority of the nine-member board. “I’m extremely pleased,” said Bob Fine, who wanted Gurban to keep his job. “I’m impressed,” said Liz Wielinski, who voted against keeping Gurban. Fisher served as superintendent from 1981 to 1999 and was the last to occupy the superintendent’s house in Lyndale Farmstead park. He worked for Minneapolis parks for 29 years. The board decided in January not to renew the contract of the controversial Gurban, who headed parks since 2003. Erwin had explored retaining him until October, but Gurban said in a letter Friday that he won’t stay. Erwin proposes to pay Fisher $50,000 and travel expenses. He also proposes extending Gurban’s health and life insurance benefits for nine months, which along with a cash payment, would total $20,000. He said the combined amount is about what the board would have paid Gurban for a four-month contract extension. Under Fisher, the Park Board helped to renovate the city’s central riverfront while collaborating on the Minneapolis Sculpture Garden and building the Neiman complex at Fort Snelling. It also won top honors for its parks in 1989. This entry was posted in Uncategorized on March 13, 2010 by Chris. The Park Board has adopted a preliminary timeline for its upcoming search for a new superintendent. When commissioners hope to be all done: September. According to the timeline, included in a request for proposals for search firms sent out in February, the board would like to have its new superintendent begin Nov. 1, days after Minneapolis hosts a major national parks conference. Other deadlines in the timeline include hiring a search firm by the end of this month, holding public input sessions in April and formally opening up the position in May. Board President John Erwin said the dates aren’t strict — “this is not absolutely fixed,” he said — but they do represent the overall hopes of most commissioners. It notably doesn’t represent everyone — in particular, Commissioner Jon Olson, who earlier also fought the decision to begin the search for a new superintendent. Olson said he was concerned about having the superintendent begin in the middle of the board’s annual budget-setting period, which usually concludes in December. It would be a very contentious time to arrive, Olson said. “I think the timeline is just bad,” he said. But others on the board noted that because of the economy, budgets have been in such a constant state of flux that the arrival date has become somewhat of a moot concern. The board approved the request for proposals 7–1, with Olson voting “no” and Commissioner Bob Fine abstaining. 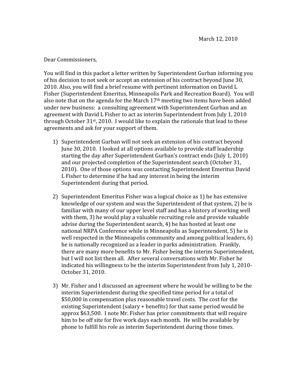 Unresolved is the board’s intent with current Superintendent Jon Gurban, whose contract expires June 30 and whom some commissioners have discussed keeping on until the search process is complete. This entry was posted in Miscellaneous on March 13, 2010 by Chris.